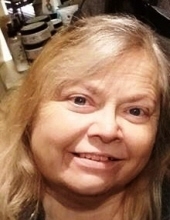 Laura June Estes Washburn, age 53, of Defoe, died Wednesday, November 28, 2018, at Baptist Health, LaGrange. She was born March 24, 1965 in Louisville, and worked as a retail clerk at Walmart and was a member of Union Baptist Church. She is survived by her husband: Martin Denny Washburn of Defoe; her father: Ralph Estes of Eminence; her mother-in-law: Marie Downey of Defoe; two brothers: Mark Estes and Brian Estes, both of Eminence; one sister: Carolyn Sams (John) of Campbellsburg; several nieces and nephews, and her fur babies: B.J. and Jade. She was preceded in death by her mother, Mary Gill Estes. Funeral services are scheduled for 1 p.m. Monday, December 3, 2018 at Sholar Funeral Home of Pleasureville. Brother Jacky Newton and Brother Joey Woods will officiate. Visitation will be from 4 p.m. until 8 p.m. on Sunday, December 2, 2018, and after 11 a.m. the day of the services. Burial will be in Pleasureville Cemetery. Honorary pallbearers are Alicia Chisholm, Trevor Sams, Ashley Henson, Emilee Dyer, Hayley Spencer, Dawson Spencer, Camon Goodrich, and Debbie Corley. Active pallbearers are Justin Chisholm, Brandon Sams, Devon Estes, Michael Estes, Mark Estes, and Homer Druin. Expressions of sympathy may be made in the form of contributions to the American Diabetes Association, 2451 Crystal Drive, Suite 900, Arlington, VA 22202. To send flowers or a remembrance gift to the family of LAURA ESTES WASHBURN, please visit our Tribute Store. "Email Address" would like to share the life celebration of LAURA ESTES WASHBURN. Click on the "link" to go to share a favorite memory or leave a condolence message for the family.